For over a thousand generations an elite society of warriors known as the Jedi Knights acted as guardians to the Old Republic. They were warriors of light, protectors of freedom and justice. Jedi let the Force flow through them, performing amazing feats of unbelievable power and proportion. The Old Republic flourished under their protection, until the power hungry Emperor Palpatine and a corrupt Jedi known as Darth Vader hunted down and eradicated the order of Jedi Knights. The only ones known to survive were Obi-Wan Kenobi and the Jedi Master Yoda. Thus began the era of the evil Empire. Years later, the appearance of Luke Skywalker offered new hope. Under the tutelage of Obi-Wan and Yoda, he learned the ways of the Force and became a Jedi Knight. 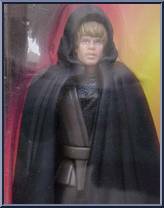 Contribute pictures, update details or suggest corrections for Luke Skywalker (Jedi Knight). Write a review about Luke Skywalker (Jedi Knight).